Pewter from VOTOČEK company. The decors with figures of women, flowers and ornaments are the most often decorated with elements of Art Nouveau style. The parts of products are casted from the alloy Britannia-metal to forms of special rubber. Casted and cut metal pieces are gas welded using special melting mixture into the final shape. 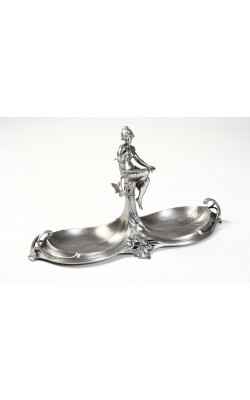 The products are grinded, patinated in bath and polished at the end. All production is exclusively hand made and it is extremely demanding precision and quality within every step of production. These unicate metalworks are made in limited editions and are signed with the company logo. 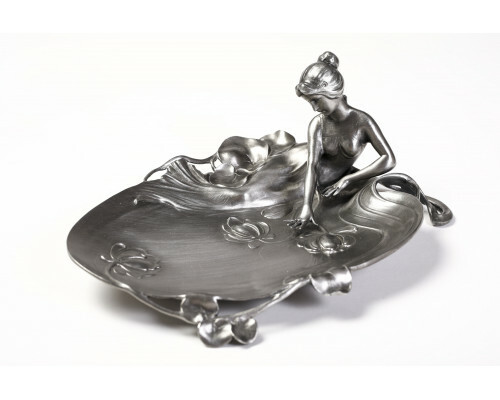 Decorative tray with relaxing lady and lotos flower decor. 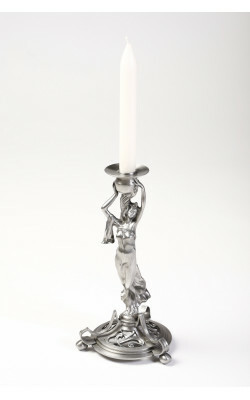 Britannia - Metal (Pewter and antimony alloy). Pewter from VOTOČEK company. The decors with figures of women, flowers and ornaments are the most of..